- Azifast 2% gel is used in the treatment of bacterial skin infections. 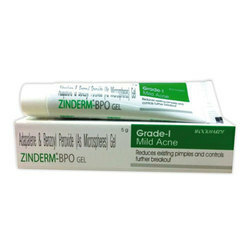 AdapaleneAdaferin 0.1% Gel is a form of vitamin A which treats acne (pimples). It works by preventing accumulation of the sebum (skin’s natural oil) which unblocks the pores and allows natural exfoliation of the outer layers of skin. We are manufacturer of Anti Acne Cream. Acnewar Gel is a medicine that is used for the treatment of Leprosy, Skin Diseases, Pimples And Chronic Autoimmune Skin Condition, Malaria, Opportunistic Infections Related To Aids And Pneumonia and other conditions. Acnewar Gel contains Dapsone as an active ingredient. Acnewar Gel works by slowing the bacterial growth by preventing folic acid synthesis in susceptible organisms.